I love paddling in dynamic conditions and playing in wind, waves and current. And I’m lucky enough to have a small network of like-minded friends who enjoy the same sort of outings. Because we elect to paddle in “more challenging” conditions, around rocks and other immovable objects, we sometimes damage boats - and yes, sometimes catastrophically. This winter has been a stormy one, offering up lots of play and a couple of seriously crunched sea kayaks. Within a two-week period, two boats were severely damaged by two different paddlers. The first was a brand new poly boat that was badly cracked in a high-speed collision in surf. Sadly, the boat was beyond repair (it was replaced by the manufacturer). 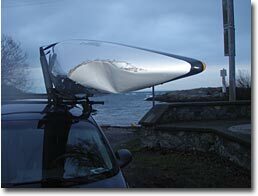 The second kayak was a brand new composite boat that collided very heavily with a rock, mashing in its bow. This kayak was repaired. Over the last seven years, I’ve owned two composite play boats and smacked holes in both of them. All this kayak carnage isn’t wholly unexpected. The rules of engagement are pretty simple: if you choose to paddle in breaking waves around rocks and reefs, it’s not so much a question of “if” you will eventually collide with something, but “when”. If you paddle a composite kayak, a heavy enough blow will generate a hole. 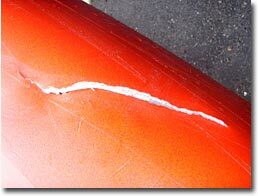 And even poly boats are not completely immune to cracking. Afloat, the real problems start very soon after you’ve created the hole in your boat – because it now has a distinct tendency to fill with water. My solution to retaining flotation is to fit a set of float bags inside my boat’s hatches. While a dedicated float bag system specifically designed for sea kayaks doesn’t seem to exist, NRS does offer a full selection of extremely durable kayak flotation bags. You can see them “torture testing” these bags in this article on their Infinity flotation bags. I’ve fitted the NRS “Split” floats in my stern compartment (two bags are required as they must fit either side of the skeg box) and th NRS “Large Standard” bag for the bow compartment. Although the bags are a little short in length, they still displace 80-90% of the water that would otherwise fill the hatch in the event of a breach. I have not fitted a bag to my day hatch as I prefer to fill that volume with my regular supplies (and since these are contained in dry bags they effectively displace water anyway). Float bags fitted to bow and stern compartments provide essential buoyancy by displacing water that would otherwise flood the kayak in the event of a hull breach, or hatch or bulkhead failure. Preventing a damaged kayak’s cargo compartments from flooding allows the boat to retain its primary handling characteristics instead of wallowing horribly or even sinking to a vertical position. Float bags provide essential buoyancy, yet add very little additional weight. By displacing water that would otherwise fill a compromised boat, float bags allow a kayaker to paddle to safety without the need for immediate repairs, wet exits or rescues. Keeping water out of the hatches, allows conventional (fast) rescues to be performed. Float bags can be transferred to another kayak if needed (a partner’s boat develops a significant leak miles from home). Please note that trying to inflate a float bag in order to displace water from a flooded kayak does not work. It requires far more pressure to inflate than can be generated by mouth. Float bags can be inflated or deflated depending on cargo capacity requirements. When only a few items are stowed in a hatch, a bag can be inflated to securely hold gear in place, preventing it from rattling around. Large float bags easily adapt to fit a wide variety of different kayaks. 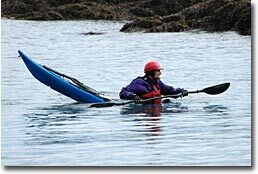 With no added buoyancy, if the crack in your boat is large enough, the distance to shore is great enough, or conditions are gnarly enough, you may have to abandon your kayak. And you may not be able to retrieve it again. Ever. From that perspective, a set of float bags is very inexpensive insurance indeed.